Glazed Yeast Doughnuts with a special ingredient: potato! Light and airy, these doughnuts or "Spudnuts" are the perfect treat for any special event or just a weekend with the family. Combine the yeast, water, potato, sugar, shortening, eggs and salt in the bowl of a stand mixer and mix with the paddle attachment until combined. Add 3 cups of the flour and mix until combined. Replace the paddle with the dough hook and continue to add flour and mix until the dough forms into a ball and doesn't stick to the sides of the bowl. Continue to knead the dough for 5-7 minutes and the dough is satiny and smooth. Remove the dough from the bowl, spray the bowl with non stick spray and place the dough in the bowl. Cover and let rise for 1½ to 2 hours or until the dough has doubled in size. Gently remove the dough from the bowl. Roll the dough into a large circle approximately ½ inch thick. Using a doughnut cutter, or a cup (and a smaller lid for the inside circle) cut the doughnuts out of the dough. Place on a greased pan or counter top, cover and let rise for 30-45 minutes or until the dough is light and airy. Cook the doughnuts in oil that has been heated to 350-375°F. You'll need to watch the temperature and adjust as needed. The doughnuts should cook and become golden brown on each side within 30-45 seconds each. Remove from oil and drain on paper towels. Combine the ingredients for the glaze and stir until smooth. 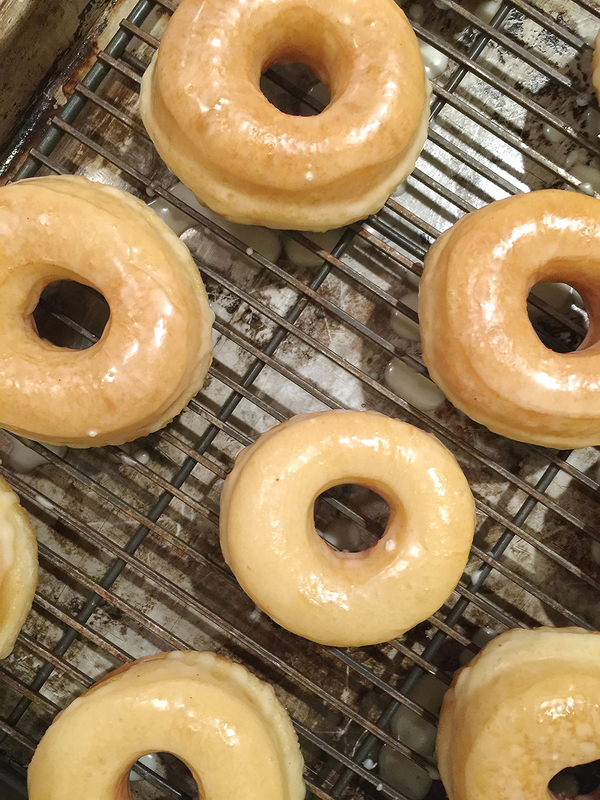 Dip the warm doughnuts in the bowl of glaze and then set them on cooling rack until the glaze sets. Recipe created by Thyme In Our Kitchen. Do you use instant mashed potatoes or real mashed potatoes? Real mashed potatoes are used, but you could try making them instant potatoes. Just keep an eye on the dough as you mix it — it may need less liquid if the instant potatoes have more moisture. These are the best donuts I ever ate. We used to get them in Brownfield, Texas when I was a teenager. I am so thrilled to find the recipe and try them. Hi, what kind of oil is used (soybean, canola, etc)? thanks!! got allergies. Typically vegetable or canola oil is used. However, you can substitute in an oil that works with your allergies as long as the oil works well in frying temperatures.